For booking and payment click on the email below. SeaView is a stunning two bedroom villa with two en suite baths & walk in marble showers. SeaView has a modern galley kitchen, a great room, vaulted cathedral ceilings and private pool. French doors open from the bedrooms and great room to your pool deck directly overlooking the brilliant blue Caribbean Sea. Tennis courts are on property for your convenience. 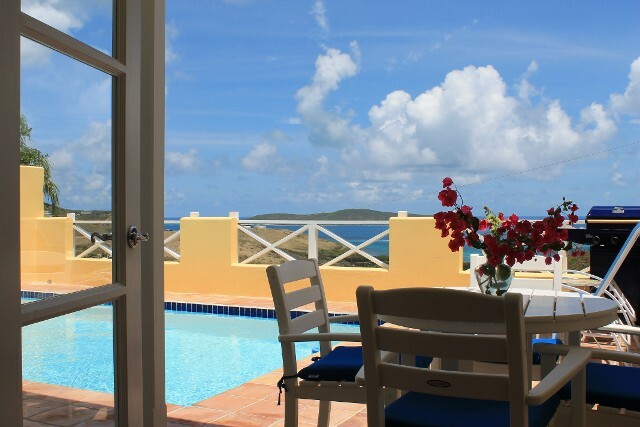 SeaView Villa is nestled into a breezy hillside just above the white sands of Reef Beach, Divi Beach and the Reef Golf Course, along St. Croix’s prestigious East End, surrounded by lush foliage with amazing panoramic ocean views of Buck Island and the Virgin Islands. Each bedroom features a wall mounted flat screen LED Vizio 32 inch tv, dvd player, king sized bed, Sealy Posturepedic mattress, chest, mirror, dresser, & air conditioning. SeaView has an eco friendly solid mahogany kitchen with granite counter tops, stainless steel appliances and Cuisinart stainless steel countertop appliances. The great room has a relaxed, sophisticated ambiance with sleek furnishings from Braxton Culler’s Meridian Collection, modern Tech-Craft entertainment center, 40 inch wall mounted Smart LED flat screen tv, Bose wireless sound system, CD disc player and an LG dvd player. The pool deck is furnished with crisp white Pollywood patio furniture and a blue Minden outdoor gas grill.